A major research project called SoyaGen is tapping into the power of genomics to really boost Canadian soybean breeding advances. Louise O’Donoughue of CÉROM walks through her soybean plots that are part of the SoyaGen maturity trials across Canada. A major research project called SoyaGen is tapping into the power of genomics to really boost Canadian soybean breeding advances. According to project co-leader François Belzile, SoyaGen is tackling three key challenges in developing high-yielding soybean varieties for Canadian conditions: adaptation to Canada’s short growing seasons; enhance genetic resistance to three of the top yield robbers (phytophthora root rot; soybean cyst nematode; and sclerotinia stem rot); and addressing the challenge of adoption of soybean as a new crop by producers in Western Canada. Belzile and Richard Bélanger, both of Université Laval, are leading this four-year project which started in 2015. The team of researchers put together come from Laval, Agriculture and Agri-Food Canada, Centre de recherche sur les grains (CÉROM), University of Guelph, University of Saskatchewan, and Prograin. Belzile and Bélanger have also brought together diverse agencies to fund SoyaGen, including grower organizations in both Eastern and Western Canada, Western Grains Research Foundation, seed industry companies, Genome Canada, Génome Québec and others. This collaborative initiative is addressing those three challenges through five activities. The researchers used two approaches to capture that genetic information. “The most comprehensive examinations were what we call whole-genome sequencing – determining the entire sequence of all the DNA in a specific soybean variety. We did that for 102 different varieties that we felt captured the diversity present in the Canadian soybean crop,” he explains. “Then in parallel, we developed methods that allowed us to do more of a genome scan. So instead of inspecting every single base in the nucleotides [the building blocks of DNA] – there’s a billion different [base pairs] in there – we wanted to do more of a spot check here and there, which would be a lot less expensive but would still yield a lot of useful information,” Belzile says. “By pulling these two together, we are able to provide breeders and research scientists with a very good idea of how varieties differ from each other, how closely related they are, and those sorts of things.” This genomic information is invaluable for crucial tasks like the use of DNA markers to rapidly screen breeding materials for traits of interest. Using markers is much more efficient than having to take weeks or months to grow seeds into plants and test them for the traits of interest. In addition, the researchers have transferred their genetic characterization methods to the genotyping service already operating at Laval. “Now, if somebody from the private or public sector wants to have their soybean lines characterized using these technologies, this service is available,” Belzile says. So, some of the work in Activity 2 involves identifying and understanding the genes affecting maturity. Through characterizing the 102 lines in Activity 1, the researchers have been able to group those lines into five different maturity packages – different combinations of genes that control maturity. Louise O’Donoughue of CÉROM walks through her soybean plots that are part of the SoyaGen maturity trials across Canada. Activity 3 revolves around the races of soybean cyst nematode and of Phytophthora sojae, which causes phytophthora root rot. Knowing which specific races/pathotypes/strains of a pathogen occur in an area is important for both breeders and growers. Breeders need that information when using genes that confer resistance to only certain races of the pathogen. And growers need to be able to choose varieties with the right resistance genes for the races in their fields. However, current techniques to determine the races of Phytophthora sojae and soybean cyst nematode have limitations such as being time-consuming, complicated and/or unreliable. 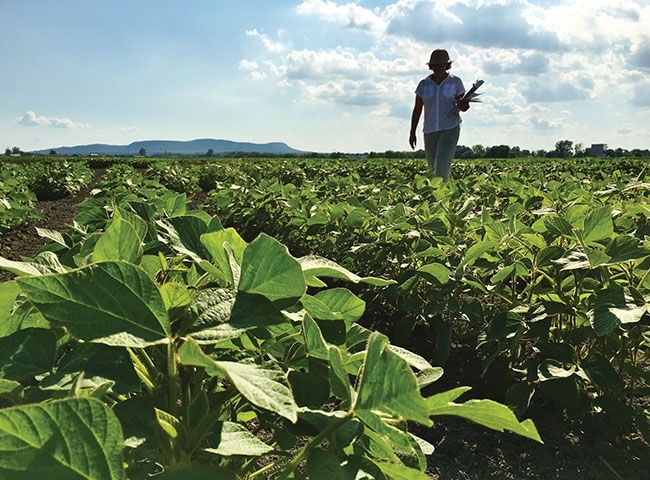 As well, the researchers hope to collaborate with government or industry to conduct systematic sampling for Phytophthora sojae in Canada’s soybean-growing areas. Then they’ll use the new diagnostic test and produce a map of the distribution of the pathogen’s races for use by growers and breeders. Ideally the map would be updated every few years to keep up with the pathogen’s race dynamics. Activity 4 is developing new, more effective resistance genes to fight Phytophthora sojae, soybean cyst nematode and Sclerotinia sclerotiorum, the cause of white mould. For each of these pathogens, the research team is identifying soybean lines with new sources of resistance and developing DNA markers associated with these resistance genes. Breeders will use the markers to bring the new resistance genes into their breeding materials. “In the fifth Activity, we’re trying to understand the barriers to soybean adoption in Western Canada,” he says. “For example, is it that farmers feel they don’t have enough information about how to grow the crop? Is it that there is a lack of adapted germplasm that will do well in their region? What are the issues facing farmers in terms marketing their crop, transporting it to crushing plants? These are the types of questions we are trying to answer.” This socio-economic work will be engaging growers, agronomic consultants, extension specialists and others in the research process, in the design of better extension tools and in the development of an extension strategy to increase the adoption and success of soybean production on the Prairies. The Canadian soybean genomic information and the genotyping methods developed in Activity 1 provide a powerful springboard for further soybean breeding work. One of the ways the researchers are working toward leveraging this effort is by developing a new method for selecting promising breeding materials. “We want to use information on the genetic makeup of a soybean line to determine whether or not that line is promising or not,” explains Belzile. “Right now, a breeder makes a cross between individual A and individual B. At some point down the road, the breeder looks at the progeny of that cross and how the plants are behaving in the field and makes selections based on that.” It takes many years, a lot of plots, and a lot of data collection and analysis to assess something like the yield potential of a specific progeny. 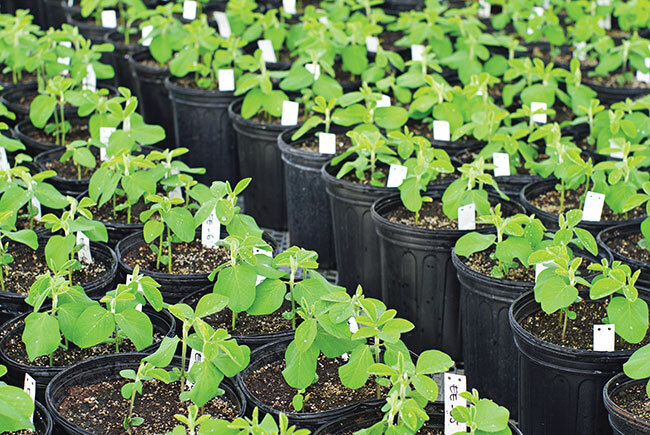 So a breeder could determine the most promising plants much earlier in the breeding process, saving time and money – and bringing new varieties to growers faster. “We already use genetic information to select lines that have certain characteristics. For example, you might have a genetic test that will tell you that this line has the right gene to be resistant to soybean cyst nematode. That’s one test for one trait,” he explains. The SoyaGen team is making substantial progress, developing practical results for Canadian soybean breeding programs, advancing the development of higher yielding, more disease-resistant, early-maturing varieties for growers, and providing a foundation for launching future breeding success. For more information on these projects, visit soyagen.ca.